It’s International Amiga Day. And nearly thirty years have gone by. I never saw that coming. 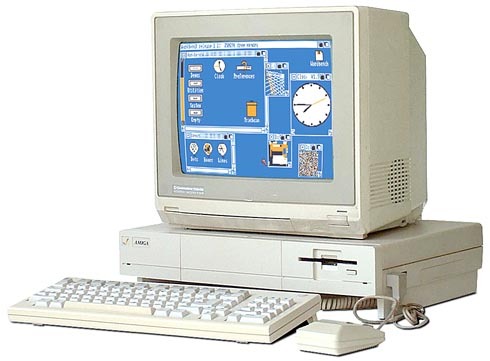 I was aged twenty-five when the Commodore Amiga A1000 was launched. No-one knew at the time, at least in public, what a struggle that glorious machine had to be born. But whatever difficulties it had, it was written in the stars that it would have a mighty destiny. And so it came to pass. From my personal point of view at the time, working for the local Council and not getting paid very much at all, there was no prospect of me ever owning that remarkable machine. I live in Walsall, England, a town in an area which is known as ‘The Black Country’ (it inspired J.R.R. Tolkien’s dark land of Mordor in The Lord of The Rings…) and not far from another, similar town known as Wolverhampton, which I occasionally visited. One dark, rainy Saturday I happened to be in Wolverhampton when the heavens opened, rain fell like a hammer blow and I was forced to seek shelter in a nearby shop, which just happened to be a business computer store. I tried to look businesslike as I sidled into the showroom, but the salesman chatting up the boss’s secretary in the back office glanced at me with a supercilious smirk and turned back to more pleasant matters as I dripped gently on the worn carpet and mooched about looking for something, anything, interesting to occupy a few minutes until the clouds might have hurried over and I could get on about my business. A pile of leaflets on Wang, ICL and IBM business computers were deathly dull, so I put them back in their dispensers and noted that the Mac was switched off so there was no chance of a furtive play. As I rounded a display cabinet, however, I beheld, lurking almost shamefully in a dark corner of the showroom, something that I could hardly believe at first sight. Much as I’d loved my Atari gear for the past couple of years, I knew that one day I must have an Amiga. I could see it was the future, at least in spirit. Even if it went the way of all digital flesh in due course, as technology comes and goes in generations shorter than dog years. The Amiga A500 had been launched earlier in the year, but somehow I couldn’t bring myself to lash out all that money on something that didn’t look all that much different from my ST. I know, I know, but there it was. Subjective, certainly, not objective. I’d fallen in love with the A1000, although it had seemed doomed to be unrequited. Maybe not. You see, this shop (I really do wish I could remember the name) had been trying to sell their one and only A1000 for six months as a business computer and, well, you can guess the rest. “Nobody ever got fired for buying IBM” they used to say. They also used to say “Garbage In, Garbage Out”, and as the son of a binman and a lifelong geek, back when it wasn’t fashionable, I knew all about that. Anyway, to cut a long story short, they’d had no luck shifting the A1000, and not long before I arrived they’d cut the price back, to just above that of the new A500. I had a grin a foot wide, as you might expect. It had been payday that Thursday, and I didn’t need any persuading when the manager leapt out from behind his desk. He looked wistful for a moment, as if half-expecting me to ask which version of MSDOS it used, but his slightly lop-sided smile turned to a grin nearly as wide as mine (and mine would have embarrassed the Cheshire Cat) as I pulled out my cheque book. Twenty minutes later, my Amiga was boxed up and we were away in a taxi, heading for an unknown future. All I knew was that something wonderful had happened, and my life would never be the same. For one thing it launched my writing career with Amiga User International and other magazines, though that eventually took a few strange turns. However, that’s another story. It’s almost thirty years now since that remarkable computer was born, thanks to the genius of engineer Jay Miner and others, and though Commodore is long gone and technology has moved on by leaps and bounds, the Amiga still has the power to make me, and thousands of today’s retro enthusiasts, grin. It did point the way to the future, and what was so amazing about that all-singing, multi-tasking, windowing, colourful, multimedia computer, born into a world of dreary DOS and black-and-white Macs, is commonplace now, though somehow, it doesn’t seem quite as much fun. Which is one reason why I’ve set up this blog, ‘AMIGA meditations’, in tribute to happy days gone by and yet to come, and to a work of genius loved by many and not forgotten despite the way of the world. Great article. The A1000 was a dream machine, I sold all my commodore gear and the money i had made meant i could fork out for one of these beautiful machines. So much forward thinking in the design, you can see engineers ran the company when it was built. Shame what happened afterwards… Anyway, a machine way ahead of its time, I got a sidecar with it….upgraded to a A2000 with a A2286 board (but the A1000 was always special). Probably the most amazing time for home computers for me, anyway. Thanks Steve, and I couldn’t agree more, the whole system was way ahead of its time, but bad management can kill the best of products. Still, the legend lives on. Nice article, I started out on the Z80 myself, SpectraVideo 728 MSX actually, but when I found the Amiga 500 with it’s sleek design ac custom graphical chips, I was sold… I cant remember, but I am sure to have read some of those articles you wrote, since that Magazine was one of the many I read at the time. Thanks Johan, glad to hear you were a reader back in the day as well. My first computer was a Texas TI 99/4A, I bought it after the Sinclair Spectrum I ordered from the first batch turned up d.o.a.! I still to this day remember the biggest computer-shop that did not mainly aim for compony clients in the biggest city near where i grew up. The name, the building and where i stood the day me and my brother had finaly saved up to replace the C64 with an A500 back in 1988. I also remember all the verbal fights with my mom about going outside or doing something else than sit on the computer. Trading floppies with everyone at school, looking at boxes of software and games and having no clue if they were any good. I concider myself lucky to have grown up in such a time when it comes to technology and the huge leaps that came about in that time. Arnt, I loved the diversity of those days as fars as computers were concerned. I know we all had our own favourites at different times and the friendly rivalry that created was fun too. But there was always something new coming out that did things differently. Sadly, today there are really only two computer systems out there and they basically do the same thing. More practical, maybe – but not so much fun!